There are two ways to check the weather in the Alps, the standard way and the Ryder-Walker way. We all know the standard way. Glance at the smartphone, read the newspaper, watch the televison. It’s easy, and it works. But is it fun? I’ve never heard anyone say they had fun while checking the weather, until now. Start by pouring yourself a glass of wine. (Better yet, let us pour YOU a glass of wine). Step outside. Position yourself with an eye-popping view of the chalet-studded alpine landscape. Breathe in the fresh mountain air. Then wait for the alpine herders to cut the grass. When they start cutting, you know you’ve got two-to-three days of clear weather ahead. 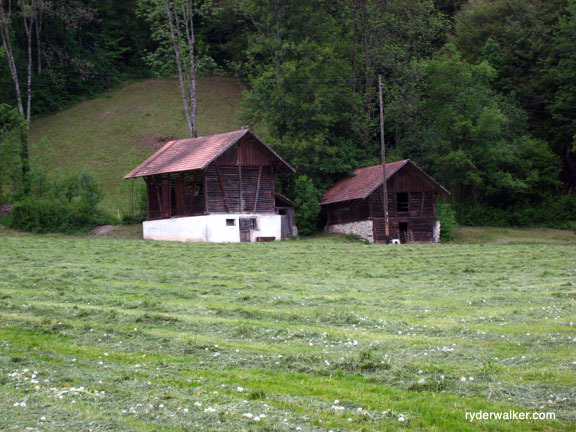 As we’ve mentioned in previous posts, the mountainside pastures of the Alps exist as extensions of low-lying farms. Cows, goats and sheep migrate to high pastures for summer grazing, while villagers grow grass and store it away for winter fodder down low. It’s this process of growing and storing that offers clues to the weather ahead. 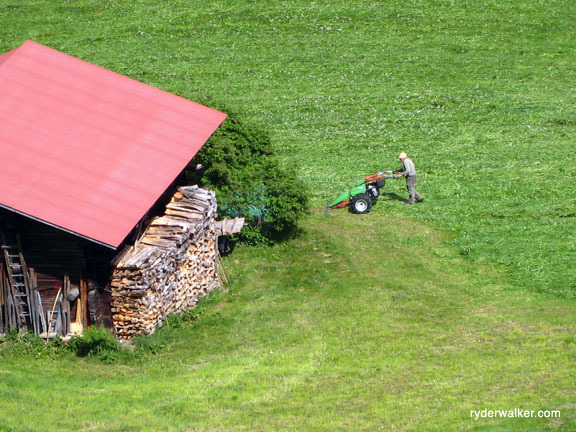 In general, alpine farmers need at least three consecutive days of sunshine to harvest their fodder. They can sometimes get away with two, but three is best. The farmers spend day one cutting the grass and spreading it out in the sunshine to dry. On day two they turn over the grass, again spreading it beneath the sun so that everything dries evenly. Day three, they harvest the grass, either stashing it away in barns or wrapping it up in large plastic pillows. In some regions, it’s still possible to find people raking hay with traditional methods. 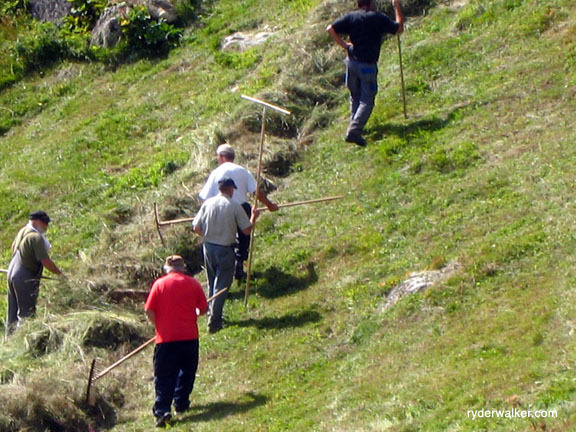 It’s a funny thing to hike into a remote alpine village and find little mountain men all cutting the grass on the same day. It’s almost as though everybody gets together and says, “Hey, let’s make Thursday grass cutting day,” which, believe it or not, they sometimes do. A few years ago, the Berner Oberland region of central Switzerland got hit with a ton of rain. I was pretripping one of our hiking tours at the time, and I remember the local farmers getting a bit stressed out. The grass kept growing and growing, but, because of the ongoing rain, they couldn’t get out and cut. Every few days they’d get a full day of sun, but the rain still threatened, so the farmers waited. Finally, there was a three-day break in the weather, and, like clockwork, everybody started cutting the grass. It was the same story throughout the entire Bernese Oberland. Grass cutting day had arrived, and I knew that I’d have at least three good days of sunny weather.